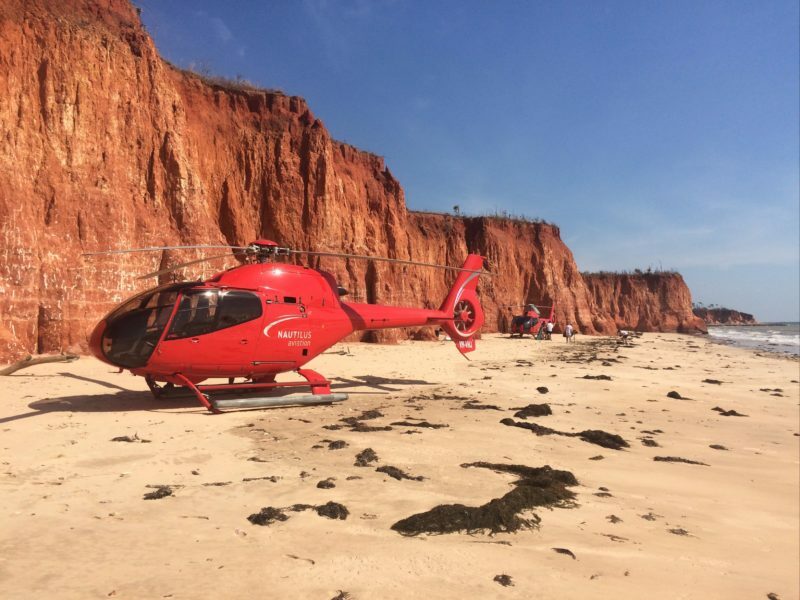 Nautilus Aviation has been operating as a privately-owned and operated luxury Helicopter charter company since 1993. With bases in Darwin, Cairns, Townsville and Horn Island their fleet is one of the largest and most versatile in north Australia. With a team of highly-trained pilots with an unrivalled amount of experience and knowledge of north Queensland and the Northern Territory, Nautilus Aviation will ensure your journey is one that you will always remember. 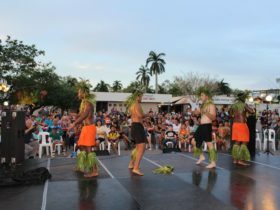 Nautilus Aviation works in partnership with a number of the regions top tourism operators, enabling them to make your visit to north Queensland or the northern Territyory extra special. We operate a range of piston and turbine-powered helicopters, allowing us to tailor our service to the needs of our clients. 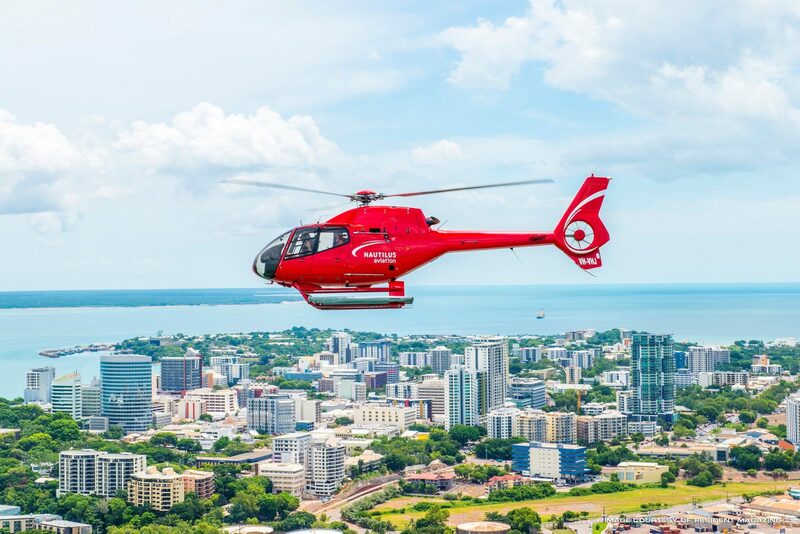 As a commitment to our industry and clients, we are constantly reinvesting in our business and we currently own 26 top-of-the-range helicopters. Executive-style fit-outs, air-conditioning, in-flight audio entertainment systems and leather interiors are just some of the features of our expansive fleet. Nautilus Aviation is equipped to ensure absolute comfort in any setting, for any operation. 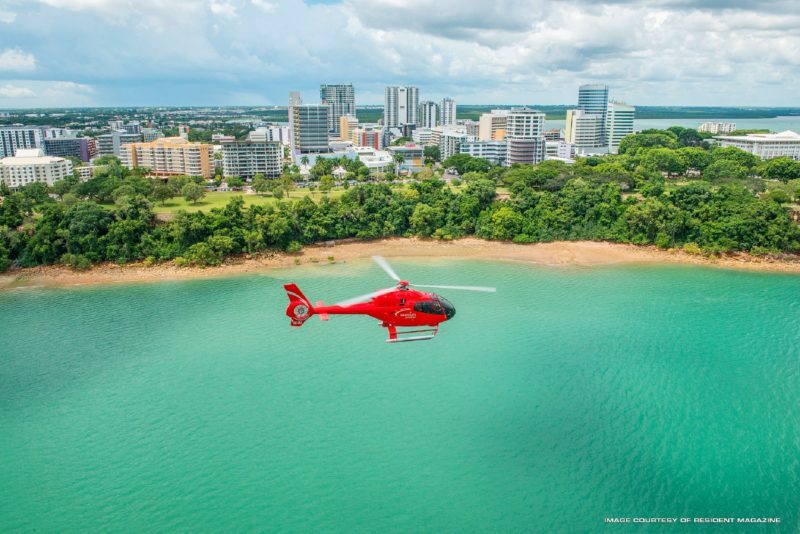 Flying coastal, enjoy Darwin City’s vast and contrasting views, while discovering from above the sights that make Australia’s northern capital so special to the people of Darwin and historically significant. This flight gives you a true layout of the city, its history and landmarks pre and post-World War II and Cyclone Tracy. Rise above Charles Darwin National Park to discover the natural, cultural, historical and modern delights from Darwin CBD to Larrakeyah Barracks and East Point Reserve. Before landing, view the two modern gas processing plants located within Darwin Harbour’s industrial area – one being the Icthy’s Project, the largest project the Japanese have commissioned outside of Japan. 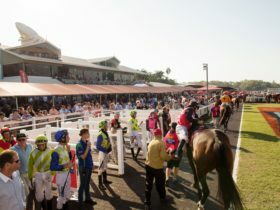 Motorsport enthusiasts, will also be spoilt with a view of Hidden Valley Motorsport Complex – the home of Australia’s V8 Supercars Championship Series. Nautilus Aviation is proud to combine a spectacular helicopter flight over Top End floodplains with an exhilarating, sensory-filled airboat adventure and safari cruise operated by Wildlands Wetlands Safaris on the majestic Mary River Wetlands. The world-class Mary River Wetlands, teaming with wildlife – and specifically, the highest concentration of Saltwater Crocodiles in the Southern Hemisphere – is a must do experience! The highly qualified and passionate guides of Wildland Safaris will take you on an unrivalled tour of Australia’s largest wetland system. From the helicopter gain a true appreciation of the size and beauty of the wetlands and from the airboat and safari cruise, close views of crocodiles, colourful flora and a myriad of native wildlife including wallabies, jabirus, sea eagles, kites, kingfishers, brolgas, buffaloes and jacanas. 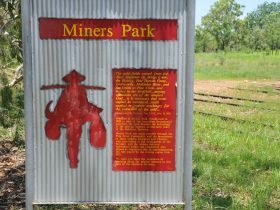 The Mary River system is an easy, 80-minute drive east of Darwin along the famous Arnhem Highway. Buy why drive, when you can fly? The seemingly endless floodplains of the Mary River are a photographers paradise. This tour is for the traveller who wants to see it all and doesn’t want to settle for anything less. *Please Note: Tour age minimum is 4 years. Options available excluding airboat. Voted one of the top 10 destinations in the world to visit, what better way to “Do Litchfield” than by Helicopter? *OPTION A: Departing from Darwin, enjoy a special 60-minute return scenic flight taking in the beauty of Litchfield’s treasure: Wangi Falls, Talmer Falls, Sandy Creek Falls, Florence Falls and The Lost City! *OPTION B: Combine your scenic flight with a remote beachside landing at Crab Claw Island Resort! Nestled on the water’s edge, Crab Claw Island is the perfect choice for a quick getaway for couples and families – even if only for a few hours! 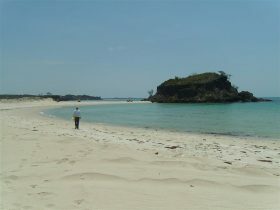 Book your flight at midday and combine your getaway with a swim and lunch at Crab Claw Island’s ‘Breezes’ Restaurant. Complete with elevated beachside cabins, Crab Claw Island Resort welcomes guest to stay and experience this unique patch of paradise! The return flight is also a treat. Take in the impressive sights of Magnetic Termite Mounds and Darwin’s main water supply, the Darwin River Dam, holding half the volume of Sydney Harbour. these grass eating termites are unique to the Top End and have an incredible feature of aligning all mounds North to South! Travel by helicopter to Gunbalanya (also known as Oenpelli), a small community in West Arnhem Land. A truly magical location with spectacular landscapes and timeless culture! The day begins sky high, immersed in a Top End sunrise witnessing morning rays awaken the vast landscape below. After your helicopter flight, enter a world of authentic traditional culture spanning thousands of years. Welcomed by Traditional Owner and personal tour guide, Mr Gabby Gumurdul, guests experience a traditional smoking ceremony and a visit to the Injalak Arts Centre. Here, Traditional art can be purchased direct from artists and guests begin their must do tour to ‘Injalak Hill’ – a superb sandstone monolith home to outstanding ancient rock art galleries. *Guests have the option to enjoy a private guided experience of Injalak Hill, complete with art centre tour and painting/weaving demonstrations. Rock Art Tours not available Sundays and public holidays. On the return to Darwin, be treated to majestic panoramic views of floodplains and towering escarpments. 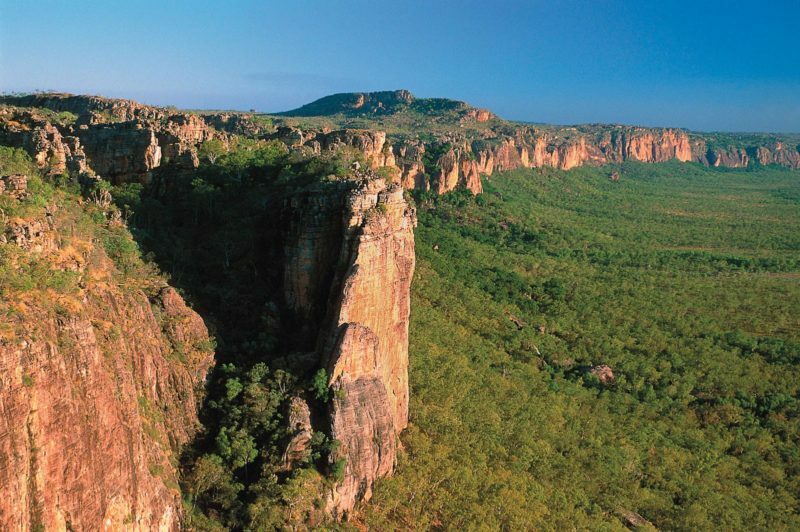 Seeing Kakadu from a helicopter is one of the best ways to experience its many magical attractions in just one day! Instead of spending 6 hours travelling by road, spend only 3 hours flying by helicopter, taking in many spectacular landscapes along the way – with various stops for photo opportunities. *OPTION A: Fly along the Arnhem Escarpment to Jim Jim Falls and Twin Falls (highly recommended during the wet season). *OPTION B: As per OPTION A PLUS stop at Cooinda for lunch and a cruise on Yellow Water operated by Kakadu Tourism. The flight home includes views of the pristine wetlands of the Mary River, Corroboree Billabong and optional flight around Darwin City. Spectacular is the word! This tour combines sweeping views of the wetlands and river systems by helicopter and up-close views of prehistoric jumping crocodiles! Enjoy a cruise on the scenic Adelaide River and see the powerful natural jumping ability of the Australian Saltwater Crocodile. With experienced guides, visitors will learn more about these magnificent creatures in their own natural habitat. This very popular cruise is suitable for all ages. Vessels are custom built with sun cover and operate on the very calm waters of Adelaide River. A collection of python snakes is on display at the kiosk and a snake-handling display is performed before each cruise. 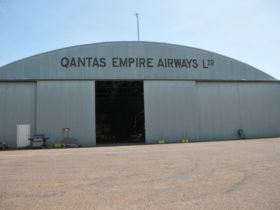 A one hour drive from Darwin, but why drive when you can fly! Pilot your own scenic flight! With a pre-flight briefing and one of our highly experience Instructors by your side, the sky really is ‘your’ playground! A once in a lifetime opportunity or the start of a career as a helicopter pilot, the total amount of flight time experienced within this product can be counted as part of your qualification – a qualification you can pursue with Nautilus Aviation! Fly to the multi-award-winning Territory Wildlife Park and spend three hours exploring the unique flora and fauna of the Northern Territory. Set on 1,000 hectares of beautiful bushland, enjoy three distinct habitats, a Birds of Prey display, an aquarium, aviaries and a nocturnal house to view animals that can only be seen at night. All sights are not to be missed and animals that can only be seen at night. 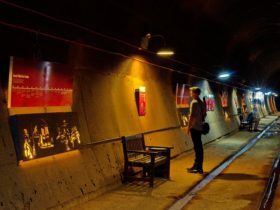 All sights are not to be missed and are connected by shuttle trains and walking paths for ease of access.